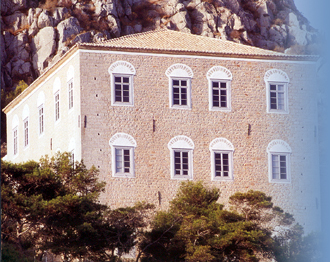 The Museum of History and Archives of Hydra, operates daily. There are: Α. File Department, Β. Museum department and Γ. Library. At the ground floor are displayed exhibits from the Balcan and first and second World Wars. In the floor it runs a picture-gallery and are displayed heirlooms and souvenirs from the Greek Revolution. to the Church of Dormition. The Museum is housed to the Church of Dormition, where the old prison used to be. It is a small Ecclesiastic and Byzantine Museum, in which are displayed canonicals, relics, oblations and icons from the 18th century. Among its beautiful exhibits one can admire the icon from 1774 of Virgin Mary "Unwithered Rose". 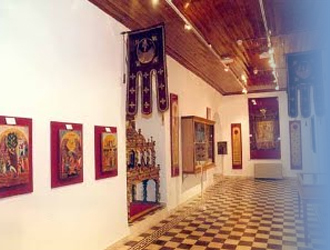 Inside the Manor of Lazaros Kountouriotis	are displayed family heirlooms, personal belongings, paintings and exhibits from the folkoric and historical collections, which belong to the National Museum of History. In the ground floor, the visitor can see various painting from the artists Periklis and Konstantinos Byzantios. In the floor there are exhibits of old furniture, mirrors, portraits and family heirlooms of thefamily Kountouriotis. The Manor of George Kountouriotis is located to the west side of the harbour, to the bank of the hill, between the pine trees. In 1991 the three stories tall Manor was bought from the Ministry of Culture and then it operated as a Museum. Inside there are exhibits of family heirlooms and exhibits from the newest history of Hydra. To the west of the town there is the four storey building Manor of Tobazi, which is being owned by the School of Art. The School of Art of Hydra island is near the statue of Kountouriotis. In the interior of the Manor there are paintings with battleships and historical events, hanging on the walls. There had been stayed most importand personalities of the Art and Literature, like Chagall and the writer Daninos. West of the statue of A. Miaouli, at the beginning of the beach of the harbor, is the art gallery and concert "Melina Mercouri". 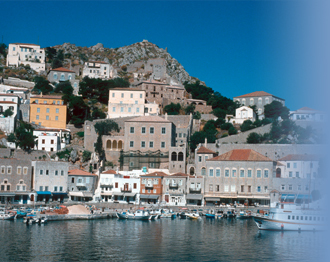 Every year, especially every summer, the cultural hall "Melina Mercouri" host exhibitions and organized lectures, concerts and cultural evenings, under the auspices of the Municipality of Hydra. In the room are hosted throughout the year by well-known artists. 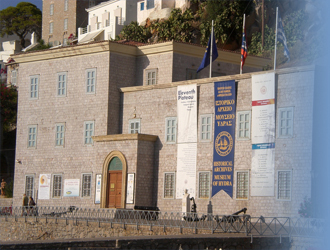 The National Merchant Marine Academy is the first Marine Academy in Greece and proud successor of the Greece marine tradition. The Academy started to operate in 1749. 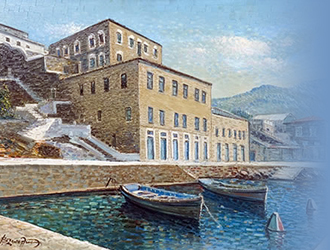 At first it was a school with the name "Saint Nikolaos" and from the 1800 it operated as Merchant Marine Academy of Hydra with initiative from the eldership of the island. From 1930 the Academy is situated to the Manor where Anastasios Tsamados and Athanasios Koulouras used to live. 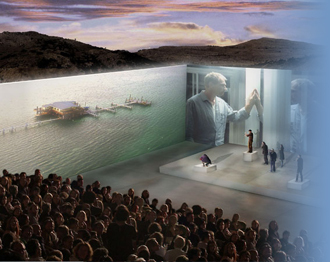 Showroom "DESTE Foundation" inaugurated in June 2009 in the old slaughterhouses of Hydra, which granted by the municipality. 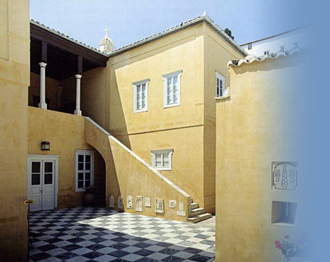 At the Manor of Sahtouris, the artist Dimitris Antonitsis organizes, for over ten years, novel thematic exhibitions. During the summer the gallery "Pauline Karpida" exhibits works from emerging artists from around the world.